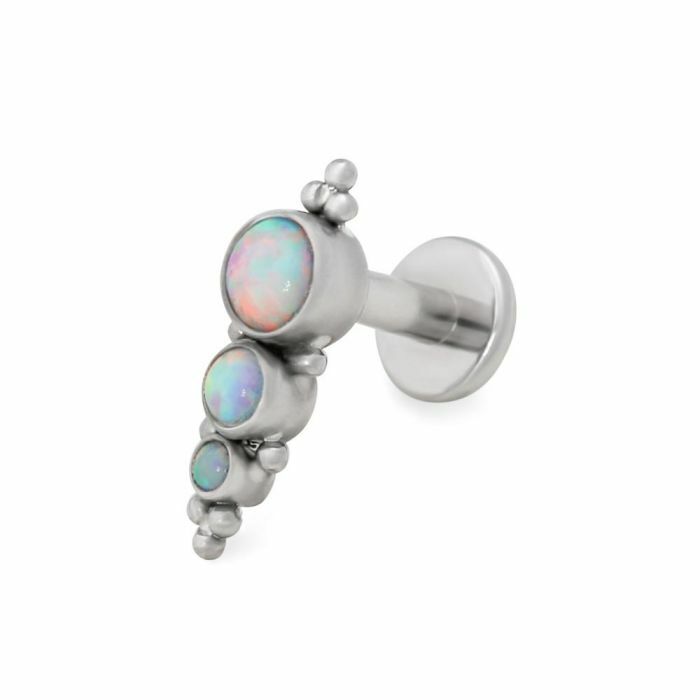 The Linear Opals Titanium Top is perfect for threading onto a variety of dermal anchors, labret posts, and other standard body jewelry. This top is made of high-quality titanium and, for a small fee, can be anodized to one of 26 vibrant color options at our PainfulPleasures facilities in Hanover, MD. The piece features three aligned synthetic opals; these opals come in your choice of Dark Lapis, Hot Pink, or White. This jewelry has internal 1.2mm threading and a 1.5mm post, making it compatible with our standard 14g or 12g body jewelry that has a matching 1.2mm internal thread pattern. The Linear Opals Titanium Top is priced per one top only.